OLM to PST Conversion - Why you need it? 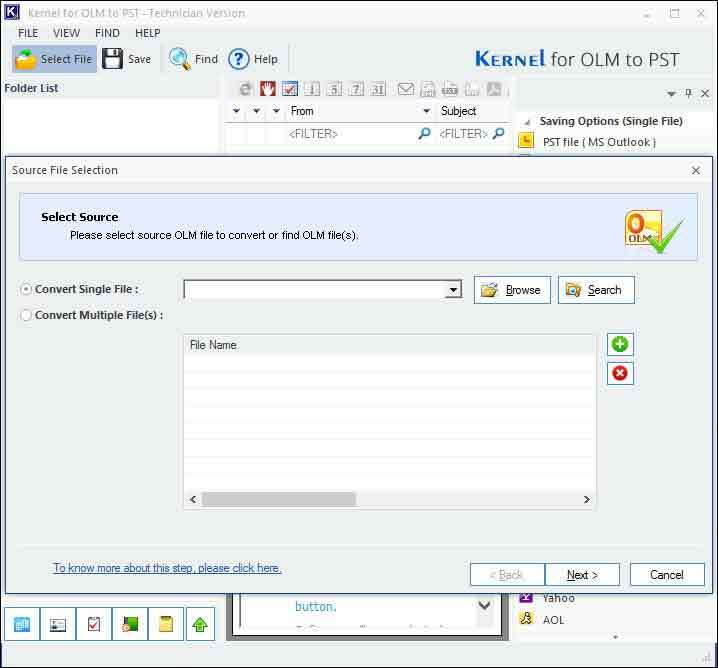 How Does Kernel OLM to PST Converter Work? The software accurately converts OLM files to PST and makes Outlook for Mac emails accessible in MS Outlook. The conversion is fast and completes in three simple steps. So, you just need to add the OLM files, go through the preview, and then save it to PST file. The software is capable of repairing corrupt or damaged OLM files. It recovers all mailbox items such as emails, contacts, attachments, calendars, notes, tasks, etc. without affecting data integrity. Even deleted items can be recovered using this OLM to PST converter. 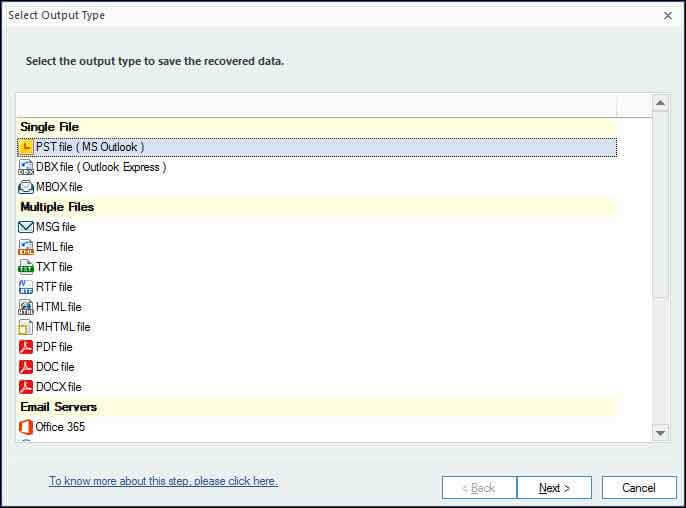 This OLM to PST tool efficiently imports OLM emails to Office 365 mailboxes. So, Mac users can directly save their OLM mailbox data to Office 365 to access their mailboxes from anywhere. With this tool, you can restore your Outlook for Mac mailboxes to Exchange Server in case if they are missing them from the Exchange database. This tool quickly restores user mailboxes from OLM files to Exchange Server. This OLM to PST conversion tool helps you in exporting your OLM files to MBOX. So, you can access Outlook for Mac emails in Apple Mail, Thunderbird, Spice bird, Eudora, The Bat, WebMail, etc. irrespective of their versions. To help you analyze the content of the OLM file in a better way, the software generates File Analysis Reports of four types - Total items types, Mail flow density by date, Mail flow density by senders, and Interaction between users. The software can save recovered OLM items in different formats such as PST, DBX, EML, MSG, MBOX, TXT, RTF, HTML, and MHTML. Users can also save the data in Office 365, different email servers (Exchange/GroupWise/Domino) and web-based email clients (Gmail, Yahoo, iCloud, etc.). The 'Find' option of the software helps the user to search for specific emails based upon different criteria i.e. From, To, Subject, Received before/after (date), and Attachment. This option is quite useful when the user needs to find some specific items quickly. 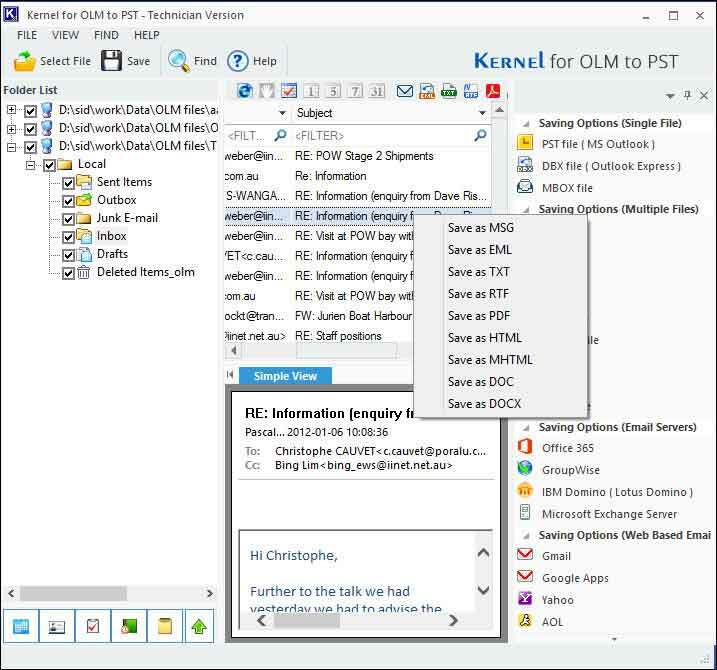 Kernel for OLM to PST software instantly converts OLM files to PST and many other formats. The conversion process can be described in three simple steps. SelectIn this step, you can select the source OLM file. PreviewIn this step, you can see preview the content of the file. SaveIn this step, you can save the folders/items in PST format in the desired location. How can I migrate Mac OLM file to PST using Kernel for OLM to PST? Download, Install and Start Kernel for OLM to PST on your computer. Click Browse button to select simple OLM file or click + to add multiple OLM files that you want to migrate or convert. If you don’t know the location of the file, use Search option. 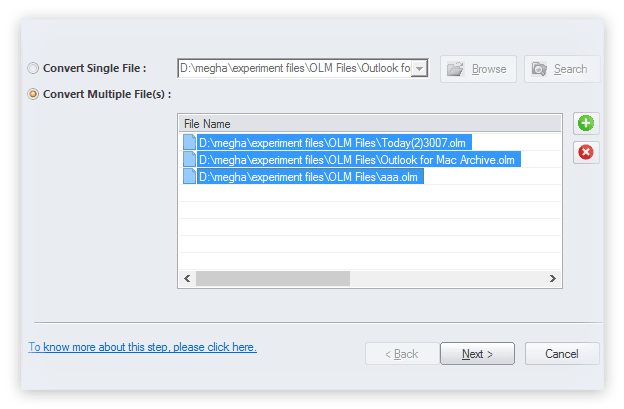 Click Next and Preview the OLM file data before migration. 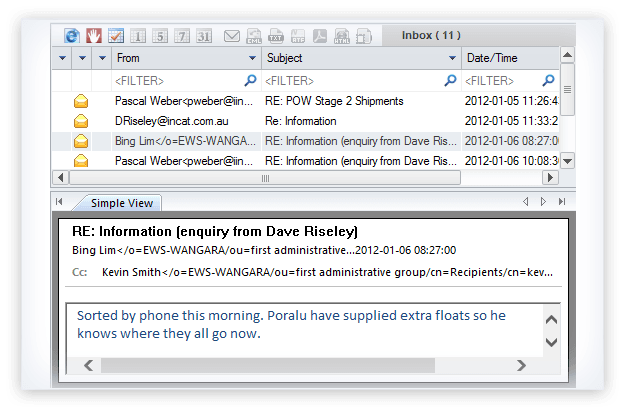 If you are looking for specific email, then use Find Now button, it will instantly search for item along with attachment. 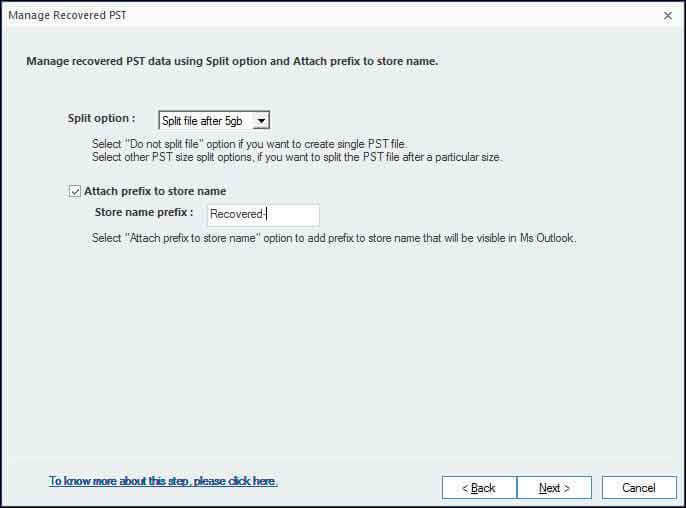 Select the output file type as PST file and click Next. 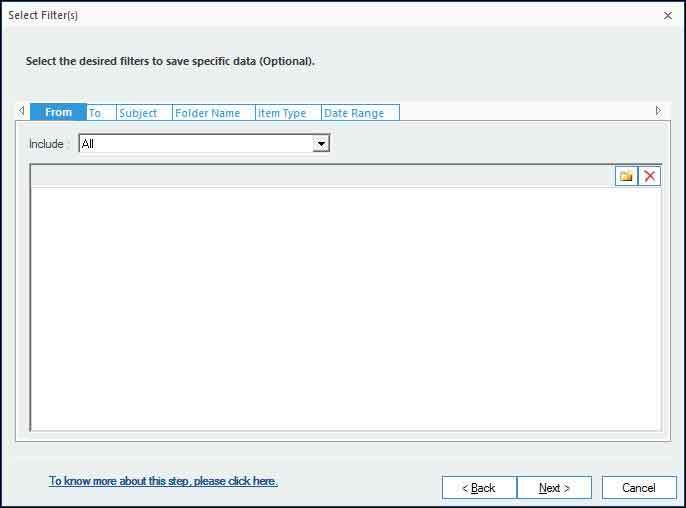 You can select the desired filters to save specific data items to PST file. 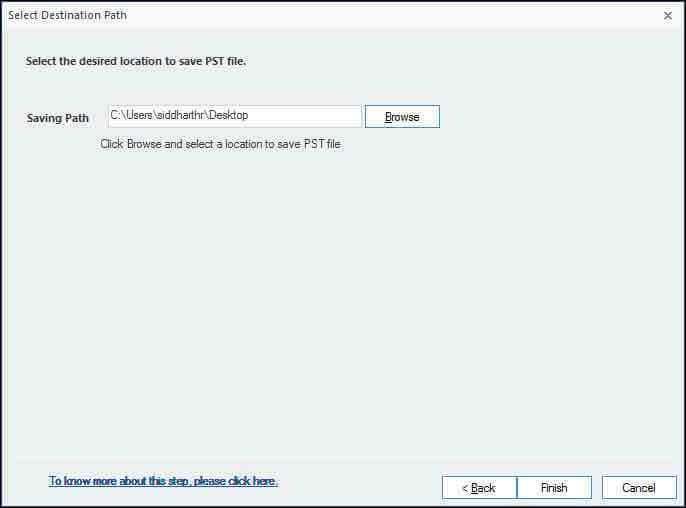 Finally, save the PST file to a desired location and click Finish. Can I perform OLM to PST conversion using the Trial version? The Trial version incorporates all features of the Full version of Kernel for OLM to PST Converter. 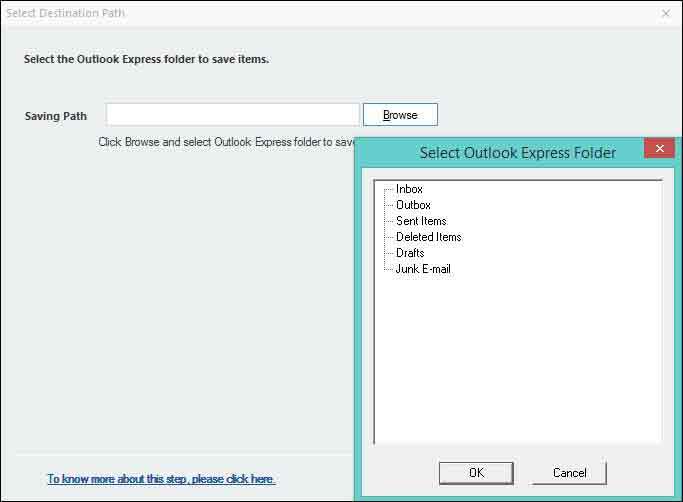 Also, user can convert 25 items from each folder to Outlook PST format free. I need to know all the requirements needed to migrate my OLM files to Office 365 using this tool. Please explain. With this software, is it possible to search and repair corrupt OLM files? Yes, the software provides 'Search' option to search corrupt or damaged OLM file (s) when you're unaware of their location. You just need to select the drive in which you want to perform the search operation, and the software will enlist the corrupt OLM files found in that particular drive. What is the maximum size limit that the software offers for exporting the OLM file? Kernel for OLM to PST Converter is capable of exporting OLM file of any size. You just don't need to worry about the file size. My OLM files are not accessible, and I need them urgently. Can I get help here? Kernel OLM to PST Converter repairs corrupt or inaccessible OLM files and perform its conversion to Outlook PST file. It also retrieves deleted items too. The conversion time surely depends on the size of the OLM file. Please provide some information on the type of licenses offered by the software. Users can buy any of the 3 licenses available for Kernel OLM to PST Converter – Home License, Corporate License, and Technician License. The Software was so awesome that I recommended it to my friends as well. I really owe my gratitude to the guys from the support team who have helped me a lot in the need. "Ola! I am Antonio from Brazil. I comes across this tool by a friend and I love the tool. It was easily installable easily used cost-effective speedily used. They have excelente Customer Support Team and"
Full preview of OLM file data, before the conversion. 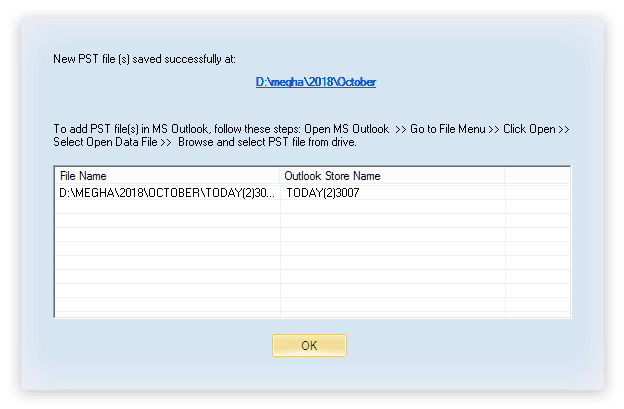 Save individual email item (OLM file) in MSG, PDF, HTML, MHTML, and similar formats. 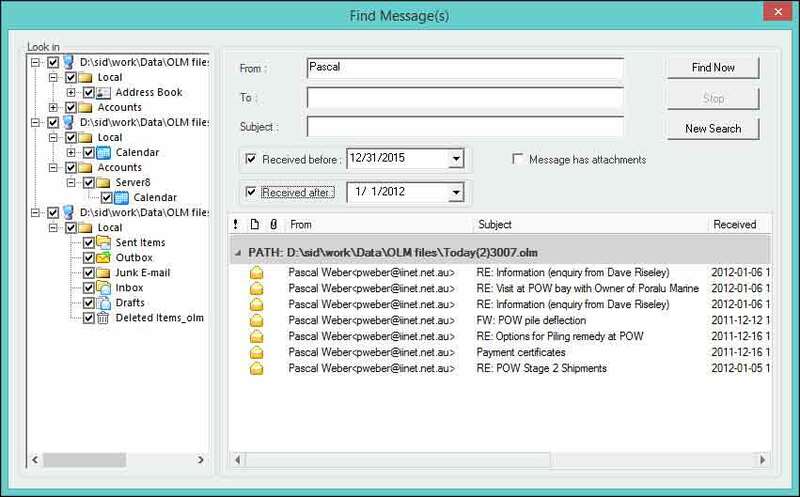 Use ‘Find Now’ button to quickly search specific item of OLM file based on: subject, from, to, message has attachment. Select any of the output types to migrate OLM data in the desired format or platform. 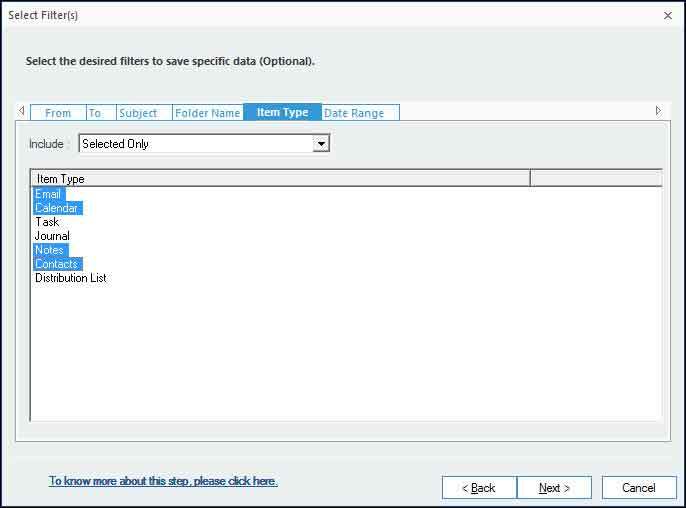 Select Filter(s) to save specific data items from OLM file to targeted location. Filtration of data items as per diverse item types. 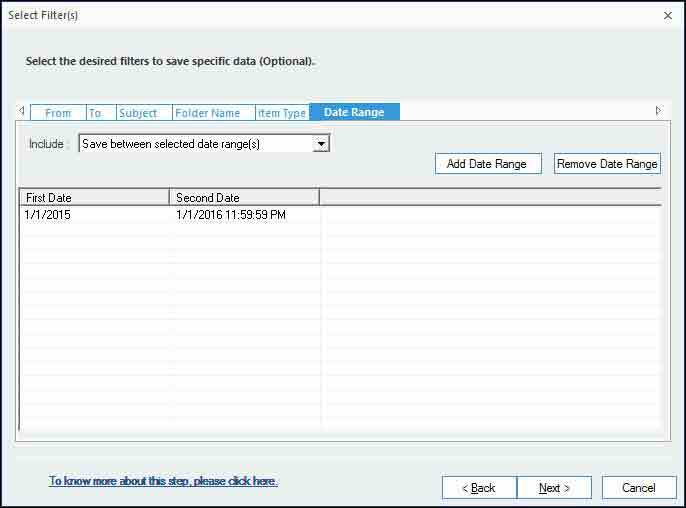 Filtration of data as per the selected date range. Define location to migrate data into PST File. Provide the location to migrate the data into DBX File. 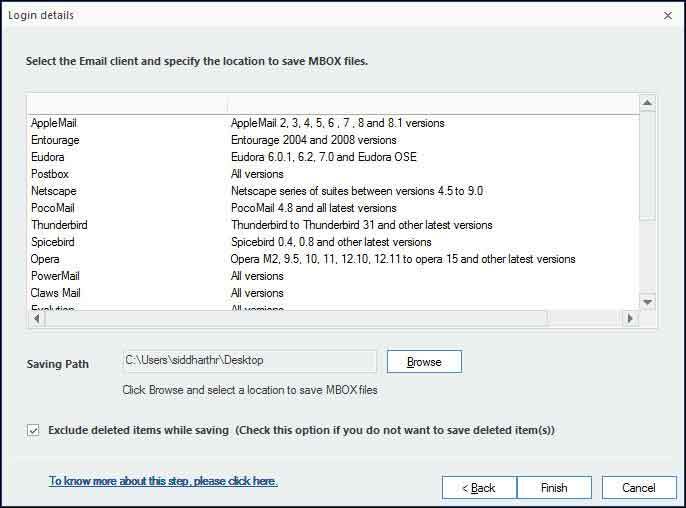 To save OLM in MBOX File: Select the desired MBOX-supported Email Client, and specify the location to save the output file. Specify the location to migrate data into MSG File. 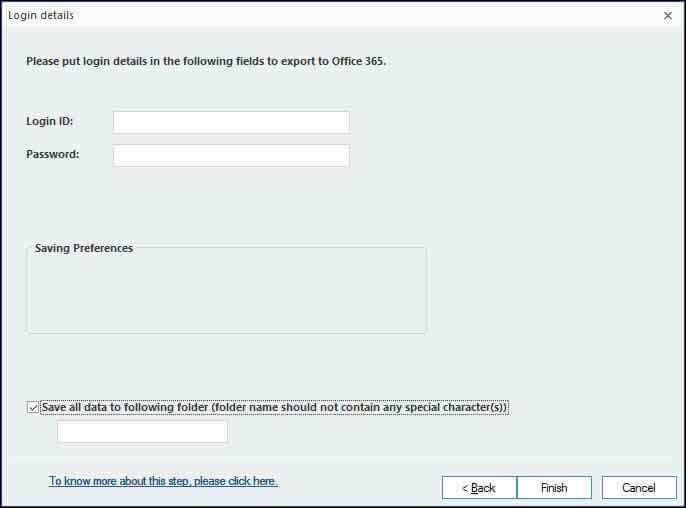 Provide login credentials for saving data to Office 365 mailbox. The updated version (18.1) of Kernel for OLM to PST Converter gets released. This tool, with its newly added features, helps OLM users to migrate OLM to PST in a hassle-free way. Also, the new version offers improved performance and faster conversion. Users can use the new version even with the latest versions of Outlook for Mac and Outlook. Lepide Software Pvt. Ltd. launches the compatible and enhanced version 15.9 of Kernel for OLM to PST software. With this latest enhancement, the software effectively facilitate the migration of OLM to PST with much agility. The latest updates now allows the tool to operate on advanced Mac Outlook 2016 and MS Outlook 2016 editions. Furthermore, the tool can now also function equally well on the improved and rich Windows 10 Operating System. Lepide Software Pvt. Ltd. releases the updated version Kernel for OLM to PST software 15.0. The new released version now provides options to save the items recovered from OLM file in PST, DBX, EML, MSG, MBOX, IMAP, TXT, RTF, HTML, MHTML, email servers, or web mails. In addition to this, now the software can also generate four types of File Analysis Reports and at same time supports Windows 8.1 operating systems. Adding to that, to install the software, now the system must have Pentium Class Processor, at least 512 MB RAM and 50 MB free disk space. Lepide Software launched Kernel for OLM to PST Version 14.07.01. The updated version of Kernel for OLM to PST is now available with better migration ability for MS Outlook 2013. Moreover, the software now also supports Windows 8.1. Lepide Software Pvt. Ltd, has successfully launched the updated version of Kernel for OLM to PST Conversion Software. The revised edition 13.06.01 now consists of powerful advanced set of features that instantly repair any OLM file. Few minor bugs that were present in the earlier version have successfully been removed and the software now ensures complete and accurate OLM to PST Conversion instantly! Lepide Software Pvt. Ltd. announces the release of updated version of Kernel for OLM to PST. The new revised version operates fast and effective enough to export all the attachments without any hitches. Integrated with advanced technology, the new version 13.04.01 can now handle all the attachments while conversion from OLM to PST. Smartly programmed, the new version is very user-friendly and doesn't require technical assistance to operate. 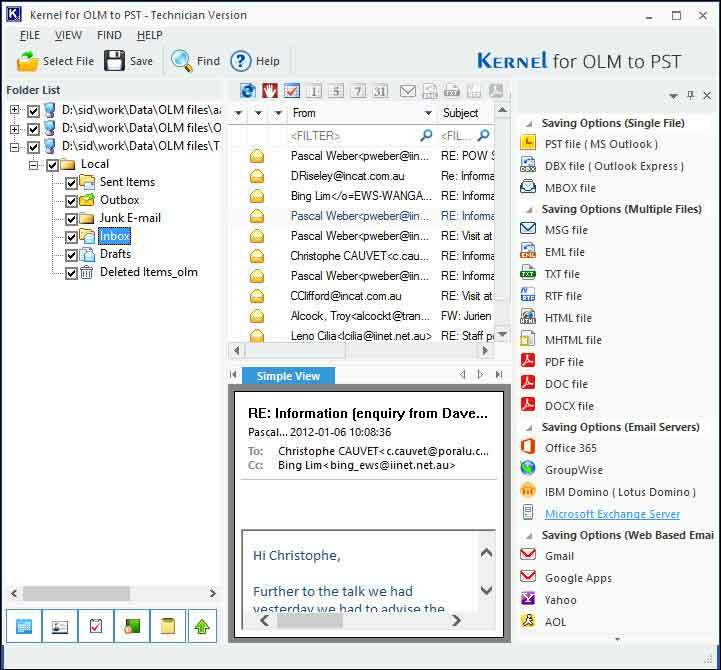 The new version of Kernel for OLM to PST conversion software (12.07.01) comes with enhanced efficiency to conduct efficient OLM recovery and repair corrupt OLM file. The software offers effective email conversion to recover emails, calendars, email attachments and other elements to restore them in new PST file. In addition, the tool is compatible with 32 and 64 bit Windows operating system and supports all versions of MS Outlook and Outlook for Mac email systems.